A no-holds-barred portrait of the pioneering pirate! Have ye ever wondered when Buck and the Cloudy Cloth Clipper first set sail on the wondrous waves of Potion Ocean? Are ye curious about how this salty old seafarer came to be the marvellous mariner he is today? 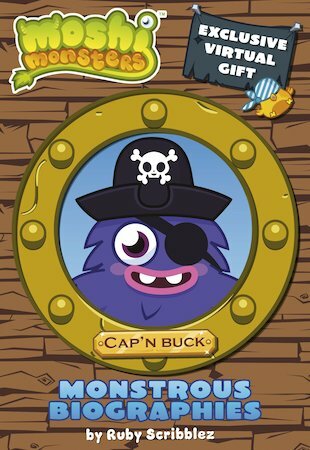 Who put the ‘Barnacle’ at the end of ‘Captain Buck E’? Well, it’s time for all your questions to be answered, as you dive deep into the treasure chest of his extra-large life! Includes a FREE exclusive virtual gift! this is the worst one so far in moshi monsters!!!!! !